Get your favorite Olive Garden soup right in the comfort of your own home! 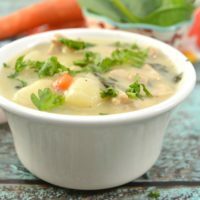 This Instant Pot Copycat Olive Garden Chicken Gnocchi Soup takes so much better than ordering takeout! Best of all you can make this copycat soup in under 30 minutes for a quick weeknight meal to serve up the family! This Instant Pot Copycat Olive Garden Chicken Gnocchi Soup makes me happier than you can imagine. Olive Garden’s Chicken Gnocchi Soup is one of my favorite soups. It is so creamy, delicious and filling. The only problem with soup is that I love it so much and it is sooooo filling. I can eat as much as I want too with any hopes of finishing my dinner. Now that I can easily make Instant Pot Copycat Olive Garden Chicken Gnocchi Soup at home I can eat as much as I want. I love to serve it with a side salad and crusty Italian bread and call it dinner. This soup is filling enough it is the perfect soup to serve as a meal. For another delicious Olive Garden soup try this Zuppa Toscana Olive Garden Copycat Instant Pot Soup recipe. It is DELICIOUS! When the temperatures begin to drop, my heart yearns for soup. Not just any soup, I crave the chicken gnocchi soup from Olive Garden. Since I got my Instant Pot, I have found how helpful it has become, especially for soup recipes. If we go to Olive Garden I skip over all the pasta options and order my soup. 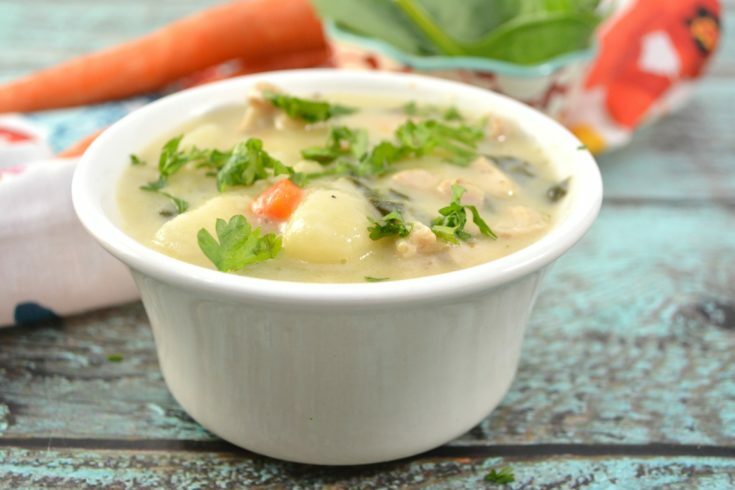 There is something magical about the flavors of this gnocchi soup. The Instant Pot helps give this gnocchi soup that low and slow-simmered taste, but you can make it in a hurry! I serve this up with a side of breadsticks or rolls, and my family enjoys every single drop. Sometimes if we have leftover chicken on hand, I will take that chicken and use it in replace of the chicken thighs. It helps cut down the prep work, and it is a great way to use up any leftovers we have. This copycat Olive Garden soup recipe is so hearty and filling; you guys will love it. Plus you will have leftovers, that taste just as good as the first day. Gnocchi is absolutely delicious, and if you have never tried them you have to! Gnocchi is a dumpling that is most generally made with potatoes, you can buy other styles, but potato gnocchi is most popular. Gnocchi is a mashed and cooked potato that is mixed with flour to create a dough that is similar to the style of a dumpling. You can use them for soups, and more. They have a pillowy texture that is so delicate, and it works so well in this soup. Melt in your mouth flavor bombs is how I refer to these gnocchi. Some stores will carry these in the refrigerated section, freezer, and by dry pasta. My first recommendation is buying the fresh, then reach for frozen, and last dry. Fresh gnocchi will give you a more fresh and flavorful soup. If you do buy frozen, toss them into the soup frozen, don’t allow them to thaw first, or they will become mushy in the soup. Grab the ingredients and give this savory soup a try! Grab your bowls with your bread and dip and slurp till your tummy is nice and full! This soup recipe will become an instant family favorite for many! 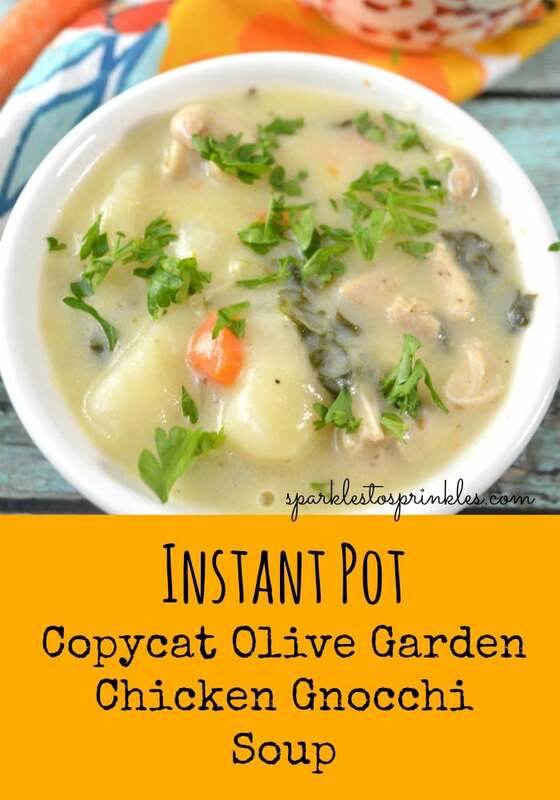 This Instant Pot Copycat Olive Garden Chicken Gnocchi Soup is so amazingly delicious and easy to make. Now it is even easier to make at home in your instant pot! Set the Instant Pot to saute. Pour in the olive oil, onions, celery and carrots. Cook until they begin to soften a bit. Sprinkle in salt and pepper to taste as well as half of the Italian seasoning. Add in 2 cloves of minced garlic. Stir to combine. 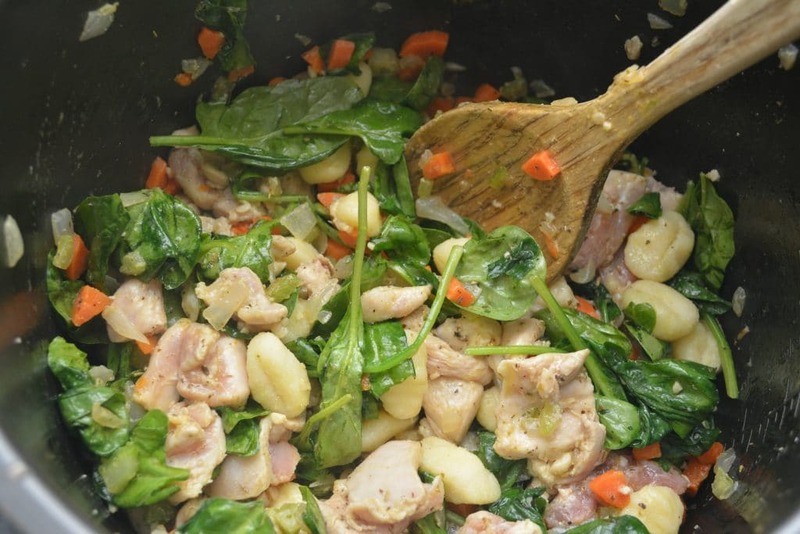 Pour in the chicken thighs, and cook for an addition 3-4 minutes, stirring often. Sprinkle in the remaining Italian seasoning and some additional salt and pepper to taste. Place the 2 cups of baby spinach into the pot, and saute with the mixture until the leaves just begin to wilt. Add in 1 pound of potato gnocchi and stir well. Pour in 4 cups of chicken stock, stir to combine, and close the lid of the Instant Pot. Close the vent on the lid, choose the Soup setting, and set it to 15 minutes. 10. After 15 minutes, let it naturally release for 5 minutes, and then do a quick release. 11. Turn the Instant Pot back to Saute, pour in the 2 cups of milk that have 2 tablespoons of cornstarch whisked well into it. Stir to combine the milk with the cooked soup, and cook for a few minutes until the soup has thickened to your desired texture. Place the Instant Pot setting to Keep Warm, and serve the soup hot with your choice of fresh herb garnish. I never thought about doing this soup in an Instant Pot, what a great idea! I can’t wait to give this a try. It’s on warm, but I had to try a spoonful & yum! I think we’re going to love this soup. Eating at Olive Garden was a rare treat when our kids were growing up. We are a couple who always work hard but never aimed for or earned the big money. Now the kids are grown & Ma and I rarely go out to eat…not at the fancy places, still can’t afford them, so I try my best to cook great meals at home. I followed the directions & I think the end product is going to be great. I just heard her come thru the door! Eating soon! Thank you for this! Oh yeah! Ma says this one is a keeper! Thanks again!